On the 15th of April 1989, an FA Cup semi-final between Liverpool FC and Nottingham Forest was taking place at the latter team’s home ground. Just before the match, the crowd started a stampede onto the pitch, resulting in the death of 96 people, as well as injuring hundreds. Investigations have been ongoing ever since and recently, a formal inquest (an investigation into an undesirable incident) has been concluded. Liverpool were facing Nottingham Forest in the FA Cup semi-final, with over 20,000 Liverpool fans travelling to Sheffield to watch the match. During the pre-match checking and preparations, an enormous crowd had flooded the stadium and managed to open one of the gates that kept them outside the stadium; flushing in thousands of fans into an already busy part of the ground, resulting in a stampede and several hundred casualties. All the 96 fans who died happened to be supporters of Liverpool FC, most travelling from Merseyside to spectate the FA Cup tie. Of the 96 deaths recorded, about 38 were children under the age of 18; of which the youngest was 10 year old Jon-Paul Gilhooley (who happened to be former Liverpool captain, Steven Gerrard’s cousin). Lawrie then went to the dressing room in an attempt to meet up with his old friend Brian Clough (Nottingham Forest manager). Campaigns have since been ongoing, from the families of the people who lost their lives in the disaster. The original investigation came to the decision that the deaths were an accident and that there was no party to blame. This conclusion had infuriated many people who insisted the investigations had not been conducted properly and fairly. It was in 2012 that a High court issued another inquest as the previous conclusion had caused a stir of controversy. A jury was elected and given various data sheets, including stadium layout and eye witness accounts; leaving them to come to a conclusion on the Hillsborough disaster. 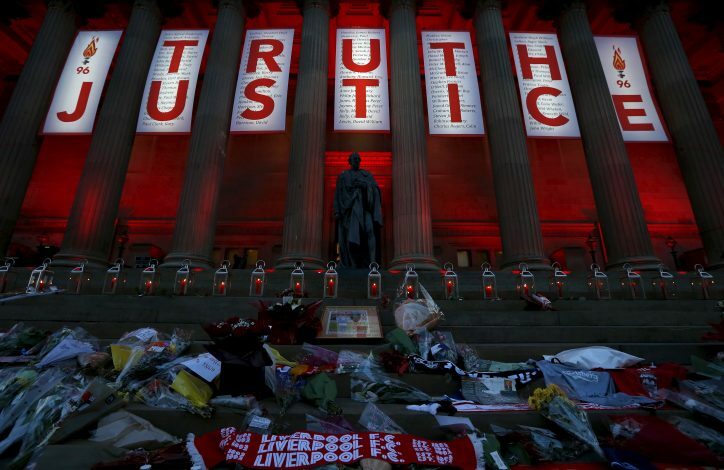 The new inquest concluded that the 96 Liverpool fans who lost their lives during the Hillsborough disaster were unlawfully killed and were the victims of gross negligence from the match commander – David Duckenfield. There was evidence to believe that Mr. Duckenfield was able to foresee the tragedy. Firstly, he had made a declaration in an old report, from 1990, that he attended the Millwall match at the same ground in which a similar incident occurred – the central pens were crammed full of supporters, resulting in the death of several Liverpool fans. Secondly, in a letter that was sent from David to his own Chief Constable, it was noted that Duckenfield had experienced the same sort of crush about 10 years before. Paul Greaney – the man who produced the documents that opposed Duckenfield – provided an outstanding argument against David Duckenfield, in which David confessed that he had in fact been frozen in a state of panic and the conclusion was brought that there was no “shared responsibility” in the Hillsborough disaster. “I disagree with you, sir,” said Duckenfield. “Because that’s my view,” Duckenfield replied. “Why is it your view?” asked Greaney. “Because it is my view, and there can be no other view than mine,” Duckenfield said. “That’s your position, is it?” Greaney asked. “It is, sir,” the former officer replied. After a lapse in time, Greaney brought up the same subject – but with the aim to end it differently. “Mr. Duckenfield, you know what was in your mind, and I will ask you just one last time: will you accept that, in fact, you froze?” asked Greaney. The jury had to be satisfied that Mr. Duckenfield knew that his decision on opening the exit gate C was one that posed a threat to the thousands of fans already in the stadium – a decision that Mr Greaney had just confirmed to them. Mr. David Duckenfield had therefore confirmed that he had dishonestly blamed the Liverpool FC supporters for the disaster. Therefore, bringing the longest inquest in British criminal history to a conclusion – made by the jury forewoman when she replied, “Yes,” after being asked “Are you satisfied, so that you are sure, that those who died in the Disaster were unlawfully killed?” by Sir John Goldring. After the Hillsborough disaster, several changes were made to the stadiums being build – making them safer than the old style fenced-in terraces where football fans would stand to support their teams from. All stadiums today are required to be able to seat all the spectators and ensure everyone is given ample space to avoid cramming. Included in the rules and regulations is the requirement of stewards to be working various sections of the stadium in order to ensure safety of the fans.